Annie Winifred Ellerman. (Bryher) REGION OF LUTANY. Chapman & Hall, London, 1914. Where is the way to thee, Region of Lutany?
' Bryher' (Annie Winifred Ellerman 1894 - 1983) was born out of wedlock at Margate in Kent; she was her parents' eldest child and only daughter. Her father Sir John Ellermann was said to be the richest man in England (like Nancy Cunard the money was from shipping.) She travelled in Europe as a child, to France, Italy and Egypt. At the age of fourteen she was at boarding school and at around this time her mother and father married. On one of her travels, Ellerman journeyed to the Isles of Scilly off the southwestern coast of England and acquired her future pseudonym from her favourite island, Bryher, home of Hell Bay. Like many writers and intellectuals of her time she migrated to Paris. 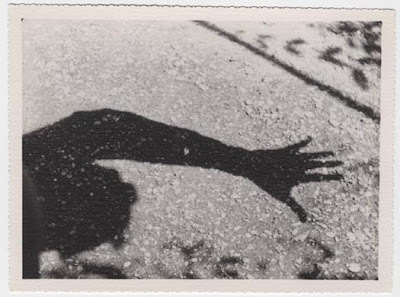 With her husband, the American writer Robert McAlmon, she founded the Contact Press. Bryher was an unconventional figure in Paris and was acquainted, even intimate, with Ernest Hemingway. Bisexual, she has been linked with many men and women of that period, including James Joyce, Gertrude Stein, Sylvia Beach and Berenice Abbott. Her wealth enabled her to give financial support to struggling writers, including Joyce and Edith Sitwell. She also helped with finance for the Paris bookshop Shakespeare and Company (started by Sylvia Beach) and started a film company POOL Productions. She also helped provide funds to purchase a flat in Paris for struggling artist Baroness Elsa von Freytag-Loringhoven the ultra eccentric Dadaist artist and poet. Shakespeare and Co published her brother's anti-public school book Why do They Like it ? also something of a sleeper and one of their very few non Joycean publications. Sir John Ellermann wrote it under the name of E L Black at the age of 16. He also wrote The Families and Genera of Living Rodents. There are two decent copies of the Shakespeare and Company work online at £450 and £500. I sold my last one at £300 in the later Blair years. The highest price being demanded for a Bryher book is a stroppy £2400 for a decent jacketed US first of her 1920 novel Development. This from a firm who seem never to reduce their prices so it may stay as a useful marker until, say, Blair is banged up for war crimes in the Eurozone. Bryher is now slightly neglected but she has her admirers and her early works are uncommon and collectable. The academic Jayne Marek describes her as an 'invisible' woman". For JM Bryher is 'even less recognized as a writer than a patron: most of her texts are now out of print and have received little critical attention. 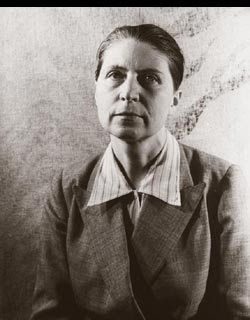 Her novels, poems, memoirs, and criticism, together spanning much of the twentieth century, form a significant contribution to the development of Anglo-American modernism, particularly through their French and Imagist influences, and their explorations of topics including women's education, gender mutability, psychoanalysis, and film technology...' Bryher's contribution to avant garde and experimental cinema is well documented. With the poet H.D. and director Kenneth Macpherson (her second husband) she started the magazine Close Up, and formed the POOL cinema group to write about and make films. 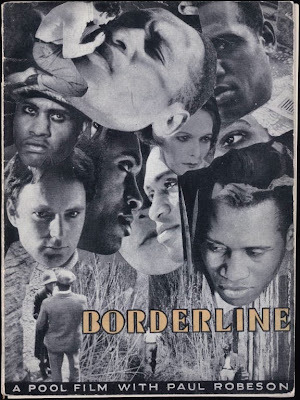 Only one POOL film survives in its entirety, titled Borderline (1930), starring H.D. and Paul Robeson. In common with the Borderline novellas, the film explores extreme psychic states and their relationship to surface reality. Another short film has recently emerged and can be seen in its entirety at the Beinecke Library site. The shadowy shot above is a still from the film Monkey Moon a silent film featuring two of Macpherson's and Bryher’s pet monkeys. Humans are absent with Bryher or possibly Macpherson only seen in silhouette or as a stout pair of shoes (Lobbs?) walking towards the camera. For me it was a very slow 8 minutes - to enjoy it you have to be a monkey person. "At the age of fourteen she was at boarding school and at around this time her mother and father married." Outdone by J.R.Ackerley: "I was born in 1896 and my parents were married in 1919." he begins My Father and Myself. Re the poodle--To be more clear you might say 'banged up in the Eurozone for war crimes' after all his crimes were further afield than Europe. Apart from that 10 out of 10. Hell Bay? Been there and it's heaven. I have Region of Lutany. Want to buy it?